The figure in arch 5 is very damaged and difficult to make out, may have had a halo. 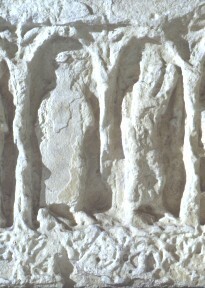 The figure in the next arch is facing to the right and the head is hooded. The fore-arms may be raised before the head or else they are holding a swaddled child. Hawkes suggests that these, and arches 7 and 8, are a Resurrection scene.